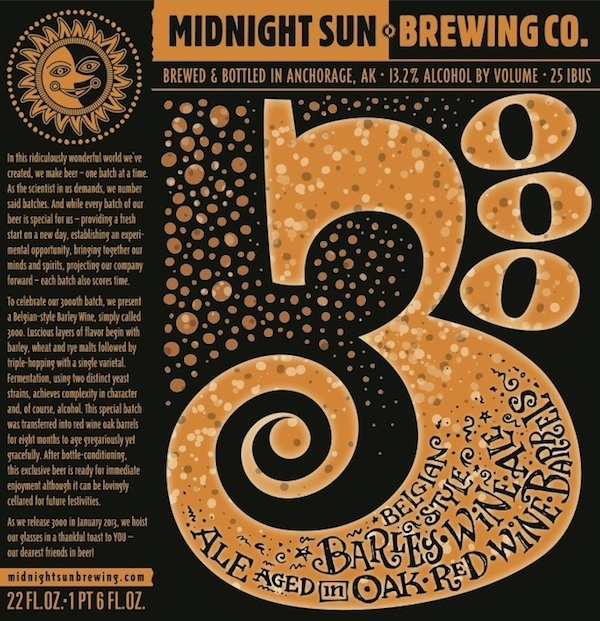 Vice President (Sales and Marketing) of Midnight Sun, Barb “La Femme de Beer” shot a fun message on her Facebook this evening regarding Midnight Sun 3000. 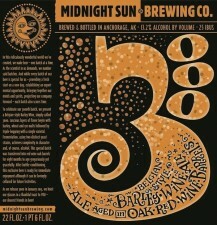 Midnight Sun’s 3000th batch of beer, simply called 3000, is slated for a mid-JAN release if the label gods cooperaTe. I got to check out 3000 today. A few very lovely sips of flat from-the-barrel Belgian barley wine. Packaging it on MON for bottle-conditioning before release. It’s tight. It’s always sO tight. But we WILL release 3000 during AK Beer Week. We WiLL! Of interest: 15 bbl batch only being sold in Alaska. Will be found on tap and in 22 oz. bottles. In this ridiculously wonderful world we’ve created,we make beer- one batch at a time. As the scientist in us demands, we number said batches. And while every batch of our beer is special for us – providing a fresh start on a new day, establishing an experimental opportunity, bringing together our minds and spirits, projecting our company forward – each batch also scores time. To celebrate our 3000th batch, we present a Belgian-style Barley Wine, simply called 3,000. Luscious layers of flavor begin with barley, wheat and rye malts followed by triple-hoppping with a single varietal. Fermentation, using two distinct yeast strains, achieves complexity in character and, of course, alcohol. This special batch was transferred into red wine oak barrels for eight months to age gregariously yet gracefully. After bottle-conditioning, this exclusive beer is ready for immediate enjoyment although it can be lovingly cellared for future festivities. As we release 3,000 in January 2013, we hoist our glasses in thankful toast to YOU – our dearest friends in beer! Can Release Daily 4/23/19 – Hudson Valley, Definitive Brewing, Moksa Brewing & More!